What I knew as fruit pizza growing up I recognise to be a pretty standard fruit tart. Maybe it’s because the biscuit base was cooked in a pizza pan? The sweetened cream cheese we spread on top? Or the thinly sliced toppings (kiwi, grapes and berries rather than pepperoni, mushrooms and olives)? Hot-smoked salmon is one of the Canadian foods I miss most now that I live in the UK. It’s slowly becoming easier to find, but cold-smoked salmon still dominates the shelves. So I was very pleased indeed to receive a stash of hot-smoked salmon through the post recently. Aside from its deliciousness, the versatility of hot-smoked salmon is what makes it such a pleasure to cook with. Kedgeree, pasta sauce, salads, fish pie, chowder, quiche – it’s an asset to them all. 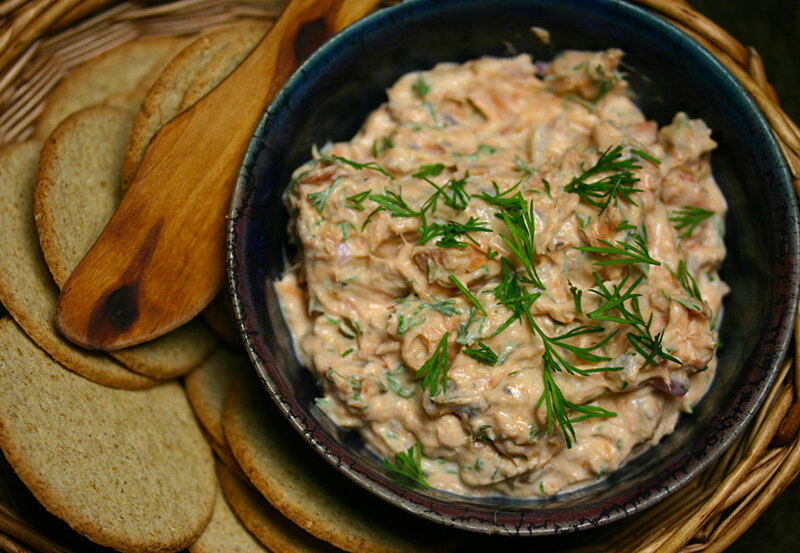 At last week’s Burns Night supper, I shared my hot-smoked salmon bounty with our guests in this smoked salmon dip.